At our kitchen table our family prepares and shares meals together, works on homework lessons, play games, and spends time talking with friends and family. It is the most important piece of furniture in our home for bringing our family together. We have also shared with you many of our reading experiences from our kitchen table; a molasses flood, papier-mache creations, pumpkin treats, and hearts for the tweets. This week we share yet another reading experience with you from our kitchen table inspired by author and illustrator John Bemelmans Marciano. Marciano tried many things before becoming a writer; architecture, working for a small newspaper, film school, CD-ROM programmer. Then, he visited his grandmother's house with the idea of writing a book about his grandfather. He found that his grandfather "kept everything he drew," which provided everything he needed to write Bemelmans: The Life and Art of Madeline's Creator. Among the collection of drawings, Marciano uncovered unfinished stories, which he compiled and illustrated as Madeline in America (1999). At the Mazza Museum Fall Conference 2013 he said, "The challenge in making the Madeline books is creating what people remember." I feel confident saying that everyone at the conference agreed that John has made Madeline his own while carrying on his grandfather's legacy. He has made four Madeline full-length picture books including Madeline and the Cats in Rome and the latest, Madeline and the Old House in Paris which was released in October 2013. He has also published a Madeline board book, Madeline Loves Animals and a few early readers, Madeline and Her Dog and Madeline's Tea Party. This is a photo from the Mazza Museum Fall Conference 2013. John Bemelmans Mariciano is on the far right. 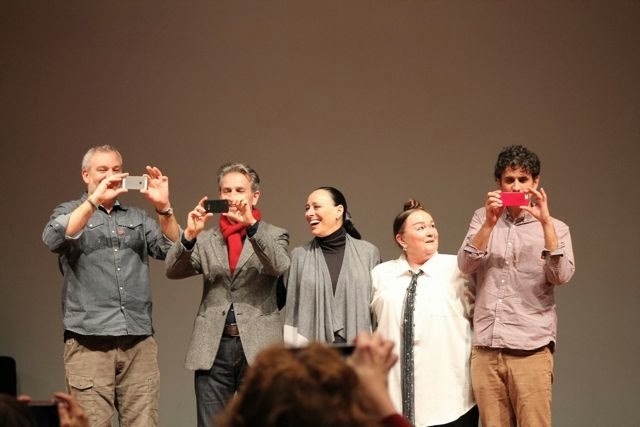 Others pictured are John Rocco, Eugene Yelchin, Robin Preiss Glasser, and Patricia Polacco. 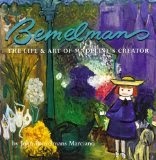 John Bemelmans Marciano is a self-taught illustrator. 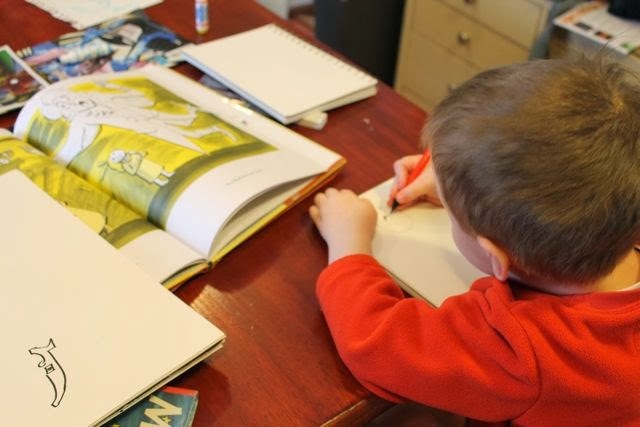 In an interview with Reading Rockets, Marciano talked about the role comic books played in helping him learn to draw, "I loved comic books growing up and I think I really learned to draw by really copying comic books. I think that's the best training that there is, taking something that you like and copying it, whether it's for art or for stories and then as you do that you can begin to add your own things to it and eventually it'll become your own." In his keynote at the Mazza Museum Fall Conference 2013 he said that he copied these comic books at the kitchen table in his childhood home. John's grandfather also loved comic books. 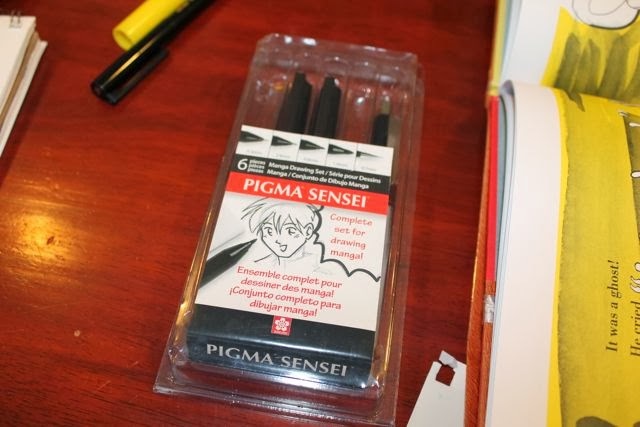 John said, "My grandfather really wanted to be a comic strip artist." Ludwig Bemelmans wrote the comic strip The Thrilling Adventures of Count Bric a Brac in the 1920s, and Mariciano pointed out that if you really look at it, "Madeline is like a comic strip ripped apart." Another observation Marciano made was that when Madeline was published in 1939 it had to compete with popular comic books like Superman. 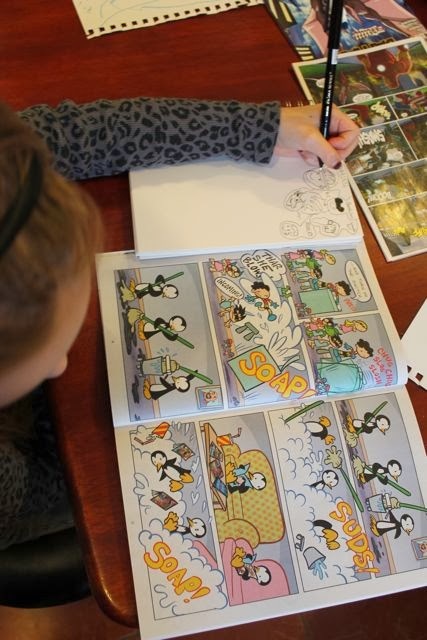 After I reviewed my notes from the conference, I realized that the best way to celebrate John Bemelmans Marciano's birthday would be visit a local comic book store, copy comic book characters at our kitchen table, and read all his Madeline books over and over again. 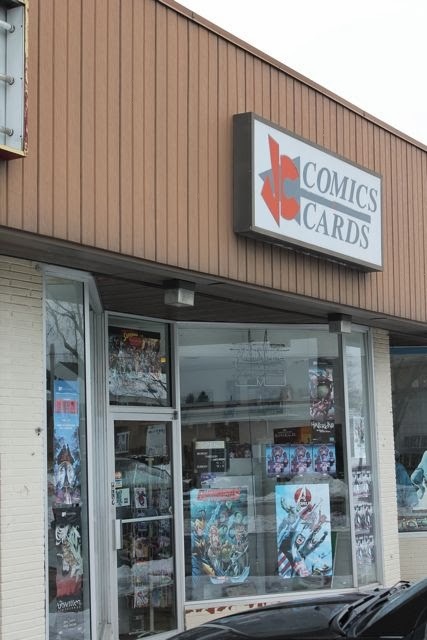 We went to our local comic book store J.C. Comics and Cards in Cuyahoga Falls, Ohio. 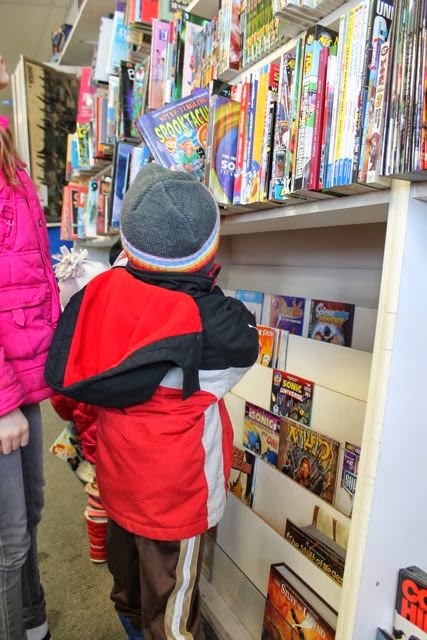 There were so many books and comics to look at. Thankfully, my brother-in-law gave us a few recommendations to guide us in our selections. 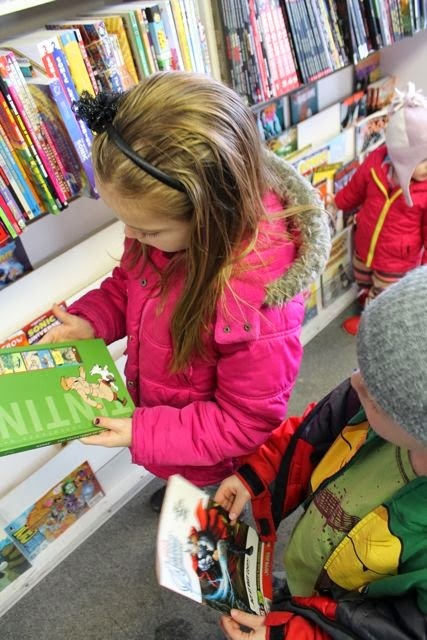 We found the Avengers Assemble, Tiny Titans, Beware of Batman comic books and a Lego Ninjago Graphic Novel. 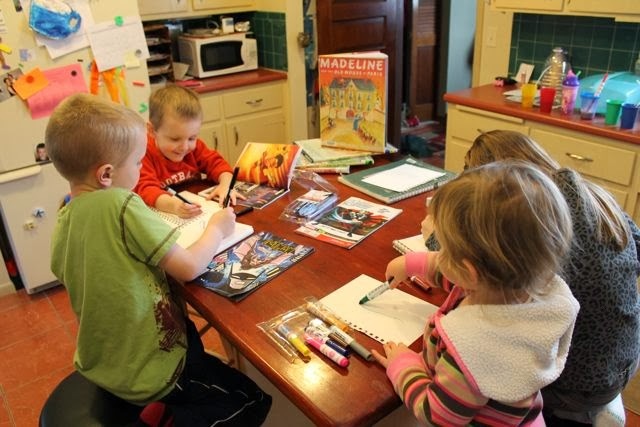 When we arrived at home we got out our sketchbooks, our Madeline books, and we were ready to draw at the kitchen table! 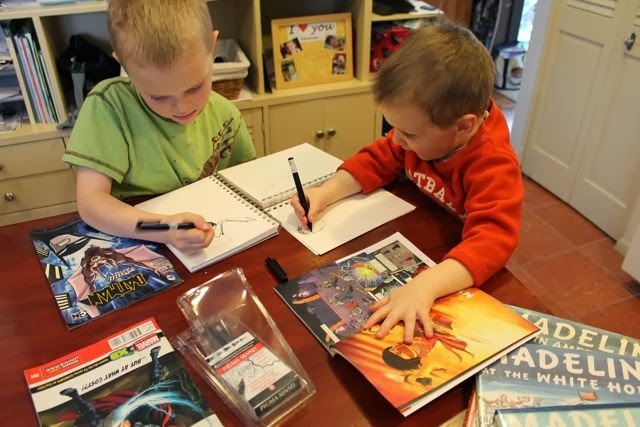 We used our new "comic book markers" too. 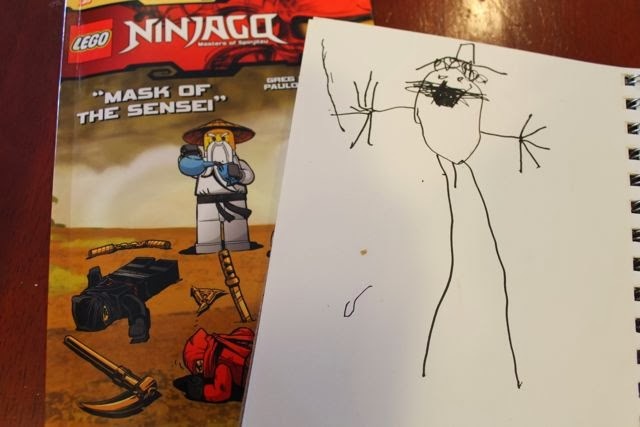 My older son copied the front cover of the Batman comic book, and my youngest son started with Nya the female ninja from Ninjago. He later moved onto the ghost in Madeline and the Old House in Paris. This was his favorite Madeline book of the week. I think we read it a half dozen times! 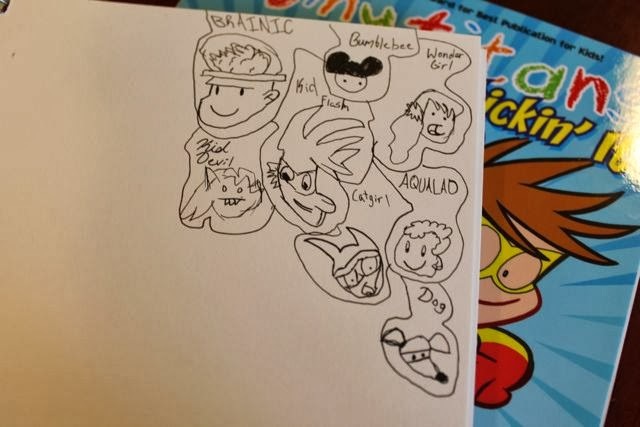 My daughter copied characters from Tiny Titans. She was very happy with her drawings. This drawing is of Sinsei Wu with his hat drawn by my youngest son. 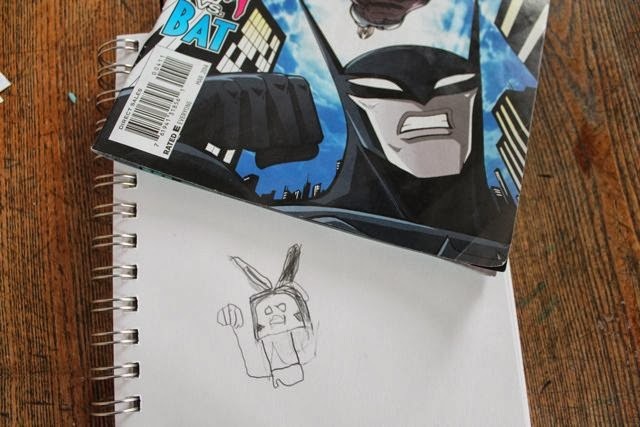 This drawing is of Batman throwing a punch drawn by my oldest son. 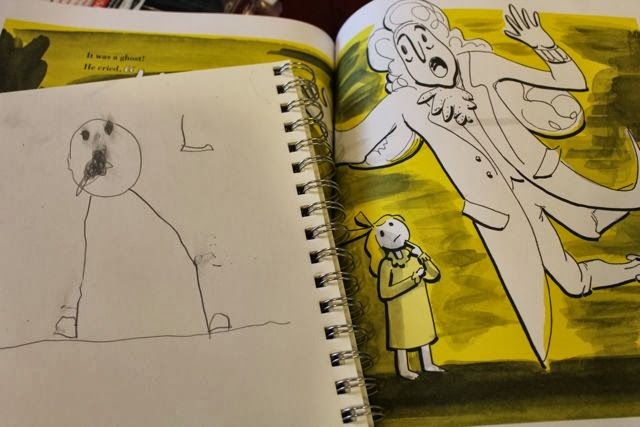 And finally, my son's favorite character from the week, Felix de Lamorte, the ghost from Madeline and the Old House in Paris. Thank you John for sharing your birthday with us and thank you for creating more adventures of Madeline for us to share together as a family at the kitchen table! We hope you have a great birthday!